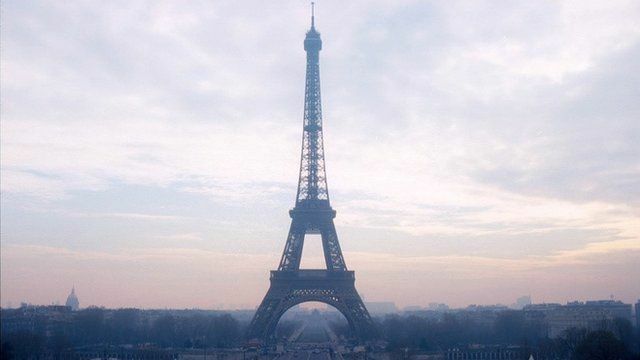 'Eiffel Tower terror plot' foiled Jump to media player The French intelligence services say they have uncovered a plot by jihadists to blow up the Eiffel Tower, the Louvre and even a nuclear plant in France last summer. Eiffel Tower evacuated over 'threat' Jump to media player The Eiffel Tower in Paris has been evacuated after an anonymous phone-call threatening an attack. Strike action closes Eiffel Tower Jump to media player The iconic French landmark, the Eiffel Tower, has been shut because of a strike. Welcome to Iraq and other art stories Jump to media player Contemporary artwork from Iraq comes to a London gallery, a number of pieces destined for the Louvre Abu Dhabi are previewed at its sister museum in Paris - and more from the world of arts. The French intelligence services say they have uncovered a plot by jihadists to blow up the Eiffel Tower, the Louvre and even a nuclear plant in France last summer. Details of the plan were hidden in encrypted messages between an Algerian butcher living in south-east France and a high ranking officer from Al Qaeda. This comes before the French government set out the parameters of new surveillance legislation giving them powers to monitor jihadist websites.